Eric Blehm is the author of the recent Wall Street Journal and New York Times bestseller “The Only Thing Worth Dying For: How Eleven Green Berets Forged a New Afghanistan.” It is the story of ODA 574’s mission with Hamid Karzai in 2001, which resulted in his rise to power as the leader of Afghanistan. The statements and opinions expressed in this guest blog are solely those of Eric Blehm. On Mother’s Day, I read the headlines about Afghan President Hamid Karzai’s highly publicized meetings in Washington, D.C., this week, and I couldn’t help but think about Barbara Petithory of Cheshire, Massachusetts, and Linda Davis of Watauga, Tennessee. Their sons were the first American soldiers killed in Afghanistan back in 2001 — number one and number two of what is today more than 1,000 Americans who have died from action there (1,744 total coalition forces KIA). Their pride and grief as Gold Star mothers are intertwined around the headlines on Hamid Karzai because their sons were with Karzai when they were killed on December 5, 2001. His legacy is, in part, theirs. Like most Americans, Linda and Barbara had never heard of Karzai back in 2001. Their only connection to Afghanistan was the suspicion that their Green Beret sons were either in that country or headed there. Every morning, since Danny’s last phone call in early October, Barbara would go out on her front porch, gaze over the Berkshire hills, and adjust the American flag draped from an angled staff. For her, the ritual was reminiscent of fixing her son’s collar when she sent him off to school when he was a little boy. She couldn’t look at an American flag without thinking of Danny. It’s the same now, each time she sees an article about Karzai. So on Mother’s Day, I contacted Linda and Barbara to let them know that I remembered Danny and Donnie or, as it is chiseled into their gravestones, Sergeant First Class Daniel H Petithory and Master Sergeant Jefferson Donald Davis. Their sacrifice still resonates in the current headlines because they, and their fellow team members from Operational Detachment Alpha 574, were directly responsible for Karzai’s rise to power. In fact, if it were not for the actions of ODA 574 — their mission became the most politically significant mission in the Global War On Terror — those headlines would be very different. In war, individuals or small groups of people sometimes find themselves in a position to influence events that shape history, for better or for worse: I submit as a profound example, Captain (at the time) Jason Amerine — a junior officer — and his eleven-man team of Green Berets (ODA 574) that included Master Sergeant Davis and Sergeant First Class Petithory. In the weeks after 9/11/2001, Captain Amerine and ODA 574 were the first American soldiers dropped into the south of Afghanistan — the most dangerous part of the country, the Taliban heartland, the Pashtun tribal belt — along with Hamid Karzai, a virtual unknown on the international stage at the time. ODA 574 made the decision to do so far from the flagpole (without the influence of the White House or the Pentagon) after meeting with Karzai and the tribal leaders who supported him. These Green Berets believed in their mission to aid Karzai’s budding rebellion, and they believed in the man himself, whom they came to respect as a popular unifying figure in the Pashtun tribal belt. Together, ODA 574 and Karzai created a plan to engage the Taliban in the south with crushing airstrikes while avoiding any civilian deaths. As a result, the Taliban surrendered to Karzai only three weeks after ODA 574 had infiltrated the country with him, mostly because their actions had led to his credibility as a warrior not just a diplomat. If the Northern Alliance leaders, whom our U.S. Forces were also supporting in the northern part of Afghanistan, had marched down into the southern tribal belt, there would have been civil war. When I interviewed President Karzai a year and a half ago, I showed him a picture of ODA 574 and, unprompted, he told me the names of most of the men, every one of whom had been killed or wounded during that three-week mission. In some cases, he recalled their specific rank or specialty — the medic, the radio man. This was some six years after that fateful day, when Karzai himself was nearly killed. Since then, he has survived multiple assassination attempts. He has been hailed as a hero and scorned as a corrupt politician. He has begged for international aid. He has, in spite of his flaws, held his country together. But even through all of this, Karzai remembered where he’d come from — and who had gotten him there. He remembered exactly who had died in the process, both American and Afghan. And he honored their memory. That told me a lot about the man. Eric's book is a compelling read. Given the compressed time frame that this book focuses upon, the economy of recalling a true story about real, heroic men falls into the highly qualified hands of Mr. Blehm. Eric's passion for the back story of this seminal event in contemporary geo-politics, allows the reader to drill into the moitvations of the 11 men tasked with a very dangerous mission. It is a carefully and lovingly crafted account of a mission that could only become clarified long after it had concluded. Whether that clarification leads someone to believe in the mission or not, is a personal decision. What cannot be misunderstood is the brave sacrifice of men fighting and often dying for what they believe in. I have also read his first book "The Last Season" and I highly recommend it as well. It is to more than understate the situation to say that Karzai is trying to build and govern a country that has immense issues spanning generations. I don't know how you go about building a coalition in a country like Afghanistan. I am certain Karzai has aligned with some characters that are plenty unsavory. Is he corrupt or just a realist as to the realities that make up the "country". I have actually read Eric Blehm's book. I can tell you for one that it is strictly apolitical. It is a story of the men involved in the mission, their relationships, grit and experience. It appears to be very well researched, comes off as very honest, and is certainly an amazing story that is well told. I can't say for sure what the reality of Karzai is today. I believe it may very well be that he is a good man, that is trying to build a country from a vast, corrupt and fuedalistic wasteland. Perhaps along the way he has had to make a deal with more than a few devils to keep it together in hope for a better tomorrow. .
Why do leaders and politiciians do what they do? What should a country do? Mothers Day vs. drugs does either matter and why? today NY Times talks of efforts but they will take time but those injvolved will be there only a year. It's hard to fathom the negativity of some of you 'arm-chair' warriors, who sit in your comfortable living rooms and degrade the folks who serve in our military. Only those that were there know what hell they went through, and what Mr. Karzai stood for then and now. He governs, as best as he can, a country that has not had a civilized, democratic government in it's entire history. It's taken the US over 200 years to get where we are today and we are, by no means, perfect. But, we keep trying. Mr. Karzai is dealing with so many 'new' concepts that his people never, ever thought they would have the chance to see. Give the Man his chance. He's not perfect, but neither was Washington, Jefferson et al, yet they, like Mr. Karzai lay the groundwork for future generations to live in peace and prosperity, just as our founding fathers did. My hats off to ADO 574 and may their lost comrades rest in peace knowing they made the ultimate sacrifice for all the right reasons. Using eyewitness accounts, Eric Blehm tells a compelling story of today's heroes. It stays with you long after you have turned the last page. Suggest reading the book for background about Karzai - and the military in Afganistan. what I've seen in his writing over the years. Seems to me if you never came there would not be this unending spiral of violence.The Taliban would be in control and there would be peace.Now you are not in control and will never be in control (God willing) and there will always be people who know what you really are and fight against you.One thing is for sure you will have lots of company with you in hell.You know the only thing Afgans want or can agree on for that matter is Islamic law, So forcing the white mans method of rule in Afganistan will keep a continuing circle of violence and much deserved revenge.Peace is best but but death is better than dishonor and oppression and the worse oppression is slavery to anything other then God's law. The situation in Afghanistan is unbelieveablly depressing. Becasue if 9-11, Afganistan is a legitimate fight for the U.S. and so we should be there, but we are faced with an Afghan leader, Karzai, who stays in power because of two things: his corrupt warlords and the U.S. military. He will not allow honest elections or get rid of the corruption and the U.S. can't force him to. Meanwhile, he is warming up to the Taliban because he wants to provide a safe place for himself in case the U.S. pulls out. If that isn't a can of worms I don't know what is. 1. Eric Blehm's book is phenomenal. He tells the soldiers' stories in a way that helped me, as a civilian, better understand what we ask of our military personnel. We, as a country, need to do more to protect, honor, and thank the men and women who sacrifice more than we can truly understand. 2. Voice of Reason's conversation with the old man in Afghanistan was insightful. Instead of spending our time debating whether Karzai is deserving of accolades, we need to be working with the governments and people of that region to figure out how to move forward. Thank you to all of the soldiers and their families who willingly sacrifice for our safety every day. Thank you Arkansas Traveler. In all accounts that I've read, from the military and elsewhere, from people who were directly involved with the events that happened in Afghanistan in 2001, Eric Blehm's book is accurate in virtually every detail. I'm sure such an accomplished author would not have gotten wrong the first two soldiers KIA in Afghanistan. Dave: If you click on the sentence to which you refer, above (in blue print), you'll be taken to CNN's own site which lists US casualties in Afghanistan by date. ODA 574's losses are the first listed. Furthermore, the book "The Only Thing Worth Dying For" does not begin with that sentence - neither the Prologue nor Chapter I. In fact, I don't recall that sentence in the book at all. Please be careful that you do not dishonor the memory of our lost and wounded Special Forces soldiers who ventured deep into enemy territory within weeks of 9/11 to help Hamid Karzai organize a resistance to the Taliban. That is what this book is about and I believe the author, Eric Blehm, went to extraordinary lengths to get the story right. Let's not insult Mr. Blehm or the brave soldiers whose stories he tells with cheap innuendo. Eric starts the story out with "the first two soldiers killed...." Makes a great opening to the story but it's not true. The first soldier killed was from Cheyenne Wyoming and was killed as a part of a battle to rescue trapped soldiers by helicopter. I was covering the ER when his Dad came in that night. If this part isn't true, what else isn't true? First I want to apolligize for my comments to your posts a couple of weeks ago, I'm sorry. Now that I know a little of your history I can put more stake in your words. From here in Iraq all I hear is from some contractors that have been there & from some of our SCWs who come from there & what I read & hear on the news. We salute your service & all who are willing to come & help. May GOD bless & keep us all !!!!!!!!!!!!!!! I keep going back to Afghanistan because I am stubborn and I want to fix things so that no one can say that we wasted all those lives, and effort in Afghanistan, and also because the last time we left things undone in Afghanistan, we paid for it dearly. I don't want my kids to have to pay for my decisions, or actions. I have talked to hundreds if not thousands of Afghans, and I do have a website where you can check out what I have gotten from the Afghans and soldiers, so I won't bore any of you here. But, something that a group of elders told me in Paktya, eastern Afghanistan, really made an impression on me. They said, you know, if you had taken all the money that you gave our corrupt government to put on this show for you in Kabul, and given it to every Afghan and told us to act like we were in a democracy or that things were safe, we would have to done it much better and you would already be home with your families. It would have been a lot cheaper and faster. Right now, you have bought our President, but he doesn't have our consent so he can't give you our cooperation. There is nothing I could say to that old man, because he is so right. please feel free to check out my website and leave your comments there. I welcome all kinds of discussion, but please keep it courteous. Thank you for posting your insights. Every individual's experience is their reality. We need to hear yours. It is incredibly brave of you to speak so honestly, not to mention, serve our country for so many years. Thank you. I'm wondering if you have heard an inside scoop from Afganis about anyone who might be a good choice to lead Afganistan? What is the word on the streets about any alternatives. Or, is just anything better than what is in place currently? Thank you for your service. Stay safe. 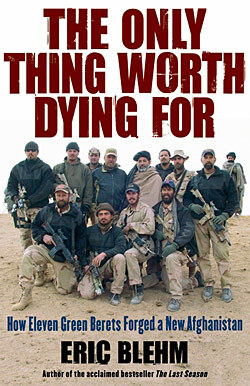 "The Only Thing Worth Dying for " is a moving account of heroic American Special Forces actions after 9/11. This history tells how Karzai empowerd Afghans to stand up to violent Taliban control. I deeply appreciate your last contribution to this blog [#21]. I'm glad you clarified your thoughts, feelings, and opinion of what is going on. I really enjoyed this book. As a former U.S. Navy Special Warfare Combatant Crewman (SWCC) it brought back a flood of memories. The storytelling was compelling and rang with an accuracy you don't find in most books that try and tell a story such as this. I don't know how Mr. Blehm was able to do it but while reading I could smell the cordite, feel the weight of my loadbearing gear and revisit the rush that only comes when one prepares for the uncertainty that lies ahead. This book succeded in presenting an unbiased, honest story of some very brave men without trying to turn them into mythical heroes. I have reccomended it to buddies I have served with over the years. Everyone of them, to a man, has expressed thier support for the book and have forwarded thier reccomendation to others. In a small community word of mouth means a great deal and Eric Blehm's book has meant a great deal to fellow operators. Dear Voice of Reason: If you note the near-simultaneous times of our posts, you'll perhaps accept my apology that my post was not aimed at you. I respect and honor your service, and I have no doubt you're in a position to know much of what's going on there today. Eric's book centers on the last few months of 2001, so the time frames are quite different. Good luck to you; stay safe. Thank you for your own bias, A Traveler. I have been in Afghanistan working with AOBs since Dec of 2004. When I am there, I really don't have time for media, popular or non popular. What I do have time for is, listening to what our soldiers are going through and what real Afghans, the one we are there to liberate, are saying. I wish my life, and the soldiers' lives were as simple as yours; reading a book and thinking you know the real story, or why we are there. I have dedicated over 5 years to that fight and I believe I have earned the right to post "these silly posts". I am sure Eric's book is amazing, and it is doing what it is supposed to be doing: making readers expert, such as yourself. while we are outraged at him for being corrupt, we tend to forget that those keeping him in power, our congress, are also corrupt. Eric went to extraodrinary lengths to get it right in "The Only Thing Worth Dying For." My son was part of ODA 574 and he assures me that Eric's account is amazingly accurate. Having met and been interviewed by Eric, I am confident that his research into all aspects of the events he recounts was extremely honest and thorough. If you haven't read the book, don't bother posting nonsense here about Hamid Karzai based on the popular media or your own prejudices. If you put in just a fraction of the time Eric Blehm has in trying to gain an accurate understanding of Mr. Karzai, Afghanistan, and our entry into the war on terror there, I suspect you'd see things quite differently. Just to clarify, I am not commenting on the book since I am saving it for the long flight to Afghanistan, when I leave to go yet again to that God forsaken country and try to understand why there is no leadership in Afghanistan to help make the country stand on its feet. I am commenting on Eric's comments in the article, which makes it look like Karzai has the good of the country in his heart, right now as he sits in the White House, begging for more of my tax money. There might have been a time when Karzai gave it everything he had, together with those fearless soldiers, but that effort did not result in what should have clearly been for the good of Afghanistan. I am sorry but my expectations for the President of my parents country are a little higher than everyone else it seems. After eight long years and several of my friends dying, and myself having lost hearing in one of my ears because of too many IEDs and road bombs, I am not happy with anything Karzai and his gang of thugs is doing to us here in the US or to the his own people, the Afghans. Read the book because it is a great story, well written, and very touching. But, don't be fooled that things are anywhere that touchy and peachy in Afghanistan of today. I was wary to pick up this book and read it because so many authors get it wrong when they try and portray the Special Forces Community. I'm here to tell you, Eric Blehm got it RIGHT... I know the men who were involved in this mission. or supported it. The author did not gloss over mistakes that were made, and did not glamorize the actions of the men. He simply told the story, and did so with a depth of research that really blew me away. He nailed the nuances of Special Forces, and brought to life those heady days after the September 11 attacks when we were running around like chickens with our heads cut off. You want the truth? Think you can handle the truth? Read this book, no matter which way you sit politically, you will not be disappointed. Thanks for your insight here. With nine years having passed since 9/11, I am ready for and want to know more about the situation in Afganistan and Karzai's leadership. You book provided an intense illustration of how Karzai was "chosen". Given the negative accusations and finger-pointing towards Karzai in today's news, I appriciate knowing (after reading "The Only Thing Worth Dying For") how he acquired his position. Many powerful fingers world-wide pointed toward Karzai as the best option to take on the presidency of Afganistan in 2001. Finger-pointing abounds now, and we must take care, lest we lose the best possible option. (Is there a better option?) I have to say, based upon our soldiers' accounts of their time with Karzai – facts put forth in your book – Karzai seems level-headed, endearing, and very human. Thank you for your years of research to shed light into a dark corner of our history. I could not put the book down. I especially appreciate your diligent and thorough research for this book. I am now much more of a student of Karzai and the Afghan situation. Your book is also an amazing telling of the commitment, brotherhood and loyalty of our special forces soldiers. Thank you for telling their story as well. It pains me to read from "voice of reason" that those soldiers died for nothing, You have clearly not read Blehm's book which not only gives great insight into the tribal factions of Afghanistan and the US Army Special Forces but details how these men lost their lives. Eric Blehm did a fantastic job researching and telling the important story of their mission. Thank you so much for this book! I picked it up shortly after its release and was taken off guard by your account of the events that led up to Karzai coming into power. Before reading it, I was definitely under the impression that Karzai was a wolf in sheep's clothing. Knowing that your words came from the mouths of the people that were on the ground with him during that critical period in history has changed that perspective. I think you've done a great service for those interested in the truth. great book. And a story that needed to be told. Yea and Obama was a community organizer but this is now ,and today you better just bring the money and we're talking truckloads of cash ,literally. You can rent an Afghan, but you can never buy one! All allied relationships are temporary and up for sale! Karzai is a great asset of India in helping us achieve our goals of sorrounding Pakistan from the other side. India must exert more pressure on USA to accept and work along Karzai. This story makes me very sad. Those two soldiers died for nothing, and it upsets me that we are allowing this Eric guy to talk like he really has no clue about the situation in Afghanistan right now. If it took the lives of two of my fellow Americans/soldiers to put him there, then its up to us to ask Karzai for accountability. I am not just talking about the millions of donated money that has ended up in his family pockets, but also for how many soldiers had to give up their lives, so Karzai can wear his green coat and come hang out with Obama. He has never done anything, has not given up anything for Afghanistan. Because he has never given anything up for it, he will never appreciate Afghanistan like the rest of us who gave more than was fair to ask. He is known as the "Mayor of Kabul" by his own people. A mayor who can't even walk the streets of Kabul because he is afraid to die. Is it worth it for our soldiers and friends to die for a man like that? I think not... the country of Afghanistan would be better off without a President who is only interested in storing away more money for his family so when he leaves the country and asks asylum of another country,he will have a nice stash of money saved up. I am sorry Eric, but I have met Karzai, and I also knew him when he was a no body in Pakistan, and i wouldn't even sacrifice my pet for him, much less my loved ones. It would be much simpler to believe in Karzai if his brother wasn't an opium drug kingpin as well on the CIA payroll. Karzai: A piece of advice. Drop the organ grinder monkey outfit and put on a suit and tie.